Back to the orders page. 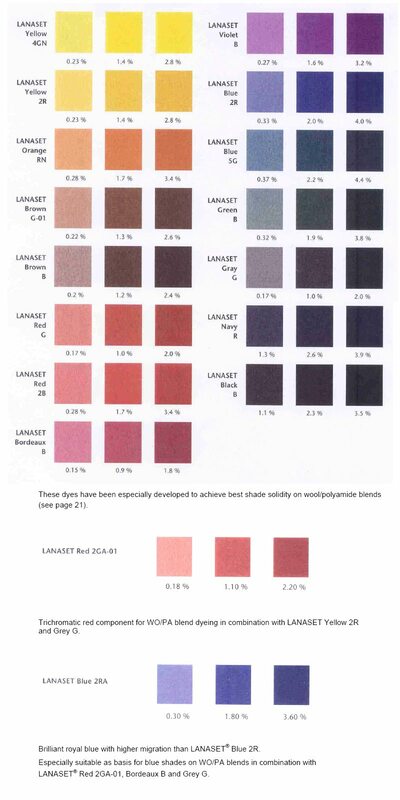 For full information on the LANASET® range, please view the PDF (2Mb). Yellow 4GN Brilliant lemon yellow for self-shades or brilliant greens in combination with LANASET® Blue 5G. Yellow 2R Cost effective basis for restrained yellow shades and combination shades. Excellent compatibility especially with LANASET® Red G and Grey G.
Orange RN Basis for brilliant orange shades with very good build up. Brown G-01 Reddish brown as basis for light to medium beige and brown shades. Brown B Cost effective basis for medium and dark brown shades. Red G Basis for restrained red shades and combination shades. Excellent compatibility especially with LANASET® Yellow 2R and Grey G.
Red 2B For brilliant red shades with high light and wet fastness properties. Bordeaux B Basis for bordeaux shades. Violet B Brilliant violet with high light and wet fastness properties. Can be shaded with LANASET® Red 2B and Blue 2R. Blue 2R Brilliant blue for royal blue self-shades with high fastness properties. Can be shaded with LANASET® Violet B and Blue 5G. Blue 5G Greenish blue with high fastness properties. Basis for brilliant greens with LANASET® Yellow 4GN. To correct shade shifts in artificial light towards green. Green B Basis for green and olive shades with a high fastness level. Grey G Bluish grey with high light fastness for greys and combination shades. Excellent compatibility with LANASET® Yellow 2R and Red G.
Navy R Brilliant navy blue. Basis for medium to dark navy shades with high fastness properties. Black B Neutral black with good build up and levelling properties at a high fastness level.